Awhile back I went to one of those marketing seminars for small businesses, and had two or three interactions with the person conducting the workshop in which I tried out my elevator speech – you know, the short, hopefully interest-inspiring description of what we or our business does. This workshop leader didn’t understand what I said — didn’t get it AT ALL, tried to replace my words with a couple job descriptors that weren’t accurate, rolled her eyes (literally) and finally shrugged in frustration and moved on to someone else. Which seemed to bring her relief – the other participants were business people who sold products she recognized, doctors with specialties we all knew the words for, even service providers whose services we all would have known where to find in the phone book. I’ll spare you the mini-roller coaster ride of my reactions to the experience – suffice to say, it was a good opportunity to reflect on giving and receiving feedback, to practice and further refine my spiel, and to do some thinking about ways we trainers empower (or disempower) participants. And this incident also raised for me today’s issue of categorizing people and things, and the value we attribute to others based on those categories. In the case of the workshop, I sensed that the person conducting the workshop thought that since I didn’t fit into a “doctor” or “widget-producer” box, what I was doing was not worthy of pursuing. But whether that’s true or not in this particular case isn’t as important as the degree to which we all attribute value on the basis of categories. In our daily interactions, we often want people and what they do to fit into categories. We ask people what they do or where are from, we want to know what social groups they belong to. If I write a blog post like this one, I will generally avoid making it “uncategorized,” as if there’s more legitimacy to a post which clearly fits into the themed boxes I’ve created. We avoid “miscellaneous” deductions in our tax returns, don’t submit general resumes (tailoring them instead to the specific job), discredit generalist liberal arts degrees, and look askance at people whose job history involves lots of different kinds of work. And don’t get me started on how hard it has been in the past to explain my Foreign Service “generalist” background and how I might still be as capable at a particular job as someone who specialized in one area over the last twenty years. This happens on a larger societal scale too – we want people to pick one out of some specified number of race or ethnicity categories (don’t get me started on that either), we prefer to think about only two gender options, we assign citizenship and nationality affiliation as if sub-national, ethnic group or cross-border cultures didn’t exist, and when war and violence threaten, all too often we’ve seen that it becomes a matter of life and death where we fit in terms of religious or ethnic affiliations. To some degree, our desire for categories is helpful. We depend on our friends and allies, people “like us,” and, like a club password or membership card, knowing where someone falls in terms of a particular category helps us sort that out. And categorizing things can be a form of shorthand, helping us not have to re-learn new things all the time (I may have never eaten a rutabaga, but knowing something about other root vegetables, I can make some guesses about whether I’ll like it, how to prepare it, etc.). And we process information by comparing it to what we know, so until we understand something that is outside what we know, we understandably and sometimes wisely treat it with caution. We ask children to not talk with strangers, we don’t eat forest mushrooms we’re unfamiliar with, and most of us don’t try to drive in a new place without some orientation or a map. But sometimes we can get pretty fixed on categories and on what we think we know, to the exclusion of things that don’t fit. In some cases, there are personal consequences — think of the kid who didn’t eat vegetables growing up and who as an adult “doesn’t like vegetables,” missing out on the delights of fresh kale, corn, beans or squash. Or the person (like me) who said “I can’t sing, I’m not a singer” and missed out for years on the sense of community and connection from participating in community singing. Or someone forced to choose a job or profession, who then misses out on pursuing the other interests that really were equally important to them. 1) It’s distracting. While I’m busy trying to figure out what category you belong to, I’m not working with you to solve a tough problem, collaborating to create a better future. 2) It’s disempowering. I got a touch of this in the workshop, and others get a far worse dose every day … if what I do doesn’t fit, does that mean I or my group are unimportant, can’t contribute, are not worthy of attention? 3) It’s unrealistic. The fact is that we are all made up of many different identities, and we’ll never be able to adequately capture who an individual or a group is with one or even a hundred labels. We have to be able to recognize multiple realities and aspects simultaneously, and to recognize that those labels and boxes change over time and look different depending on the eye of the beholder. 4) It’s hubris. Who are we to decide that it’s all knowable, that by collecting just a little bit of information we’ve got individuals or groups or the world figured out? And do we really think that we know ourselves so well that nothing inside us is uncategorizable, not yet known? 5) It’s growth-inhibiting. When I exclude new and uncategorizable people or information, I miss out on the chance to learn something new. I deny the possibilities inherent in cross-pollination, in deep exchange, in knowing someone else’s story and learning from their experiences. So, maybe you agree that getting too stuck on categories can be harmful. But we still do it, even when we know it’s not helpful. Perhaps it’s out of fear of the unknown or fear of change (better the devil you recognize and can categorize). Or perhaps we do it based on a desire for the sense of security or stability from going along with what “the group” thinks or believes about categories, or because we’re really afraid that we don’t fit in but don’t want to rock the boat by raising the issue. And maybe it’s as if we’re all operating on the idea that “value” is a commodity for which you only qualify if you fit into a category. As if what we do or who we are matters only if someone’s figured out a hierarchical system to describe it or if we’ve literally checked the boxes to acquire it. So that we require these categories to help us decide what’s important – we’re overwhelmed by input and require something to help us filter out what or who matters. That last idea is really sticking with me this morning – it’s scary. I’d like to think that I’d use other means to determine if something’s important or has value, or that I’d just assume that everything and everyone has intrinsic value … and yet I know how very often it probably has been about whether they’ve checked my boxes. My partner has a wonderful way of saying to me when I come home, “you matter, you matter.” Makes my day and has pulled me through many a tough time. Maybe we all want to matter, to be valued … and that desire has to pull us through our over-focus on categories to a place where there’s value inherent in our being, in our activity, regardless of category or label. I had nearly completed my last entry about groups that care … and I stopped short. The bump in the road? 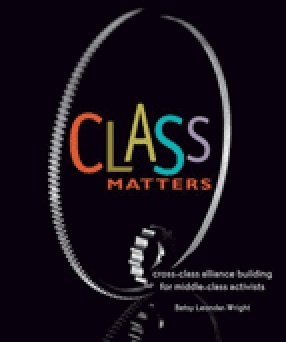 I was “geeking out”, as a friend of mine calls it, delving back into anti-classism resources for a project I’m working on, and came across this web page on class cultures (I really admire the work of Betsy Leondar-Wright, and recommend her book, Class Matters: Cross-Class Alliances for Middle-Class Activists). I’m familiar with Barbara Jentsen and Jack Metzgar’s chart comparing professional middle class and working class cultures, but as I was re-reading that chart, I flashed to my draft post and how hopelessly “middle-class” it seemed, focusing as it does on individual satisfaction and downplaying the importance of having any job, any income for food, housing, medical care and other necessities in this tough economic climate. Which brought me to an old debate about hierarchies of needs, and whether it’s legitimate to focus on these “higher” needs of individuation, meaning, etc. when “basic” needs have not been met. I’d like to believe that we all need to have all our key needs met, and that regardless of which class culture we find ourselves in, calls that everyone’s needs be met are legitimate or valuable. And yet I couldn’t help thinking of people I know who have been out of work for two, three years now, and how concerns about care in our work environments would have to be considered a luxury, at best something only to be addressed once you have a job or income in the first place. So what’s my responsibility here? I can only authentically tell my story, can’t pretend to completely understand what it might be like to be out of work, facing basic survival needs. I can’t dismiss, ignore, or downplay the importance of class in determining the focus of anyone’s attention, or the role of class, and discrimination based on class, in creating the circumstances that I and others find ourselves in currently. And, to be an ally, I must continue to increase my own awareness of class’ impact on our world and my own work, and I must work to ensure that other voices are heard. I’ll keep focusing on my class-related awareness with my project, and ask a couple working-class friends to bring us their views on this question of caring. Wish me luck, stay tuned. And a final note on why I share all this? I believe that building awareness is a continuous, ongoing process, and any time we become complacent, we risk either hitting this type of bump in the road or losing track of key issues. Collaboration requires that we recognize and value each others’ stories and strengths and challenges, and this is is my small collaborative step for today. What if .. we were motivated to collaborate? Interested in exploring how Lynangale Associates can support your collaborations? Contact us at info@lynangaleassociates.com for a free initial consultation.